A Beauty, Disney & Lifestyle Blog. Teatoxes have been all the craze the last 18 months or so. Just look on any celebrities instagram and you are bound to see a sponsored post telling us that a Teatox is the reason why they look so great. But, if you've never tried one before then how are we meant to believe that they really work? & with the many Teatoxes on offer, how do we know which one to try out? 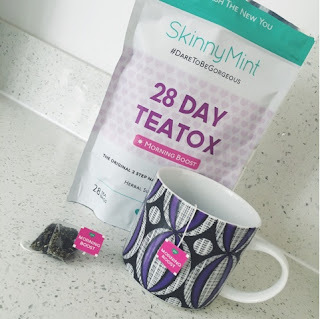 To hopefully help you make up your mind, this is my tried & tested, honest review on the *SkinnyMint 28 day teatox. I have previously done reviews on the 14 day teatox and have also done a comparison post SkinnyMint VS Bootea so feel free to check them out too! SkinnyMint is a teatox program that uses all natural ingredients to help cleanse your body, increase energy and remove all toxins. It is a 2 step program consisting of a morning tea and a night time tea. 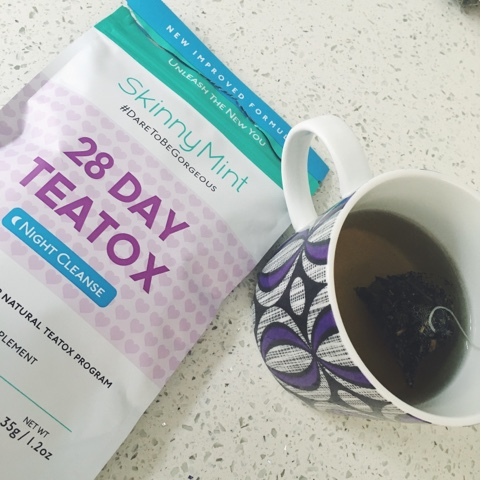 The 28 day teatox includes 28 morning tea bags and 14 night time tea bags. You have 1 cup of morning tea every morning and 1 cup of night time tea every other night before you go to bed. Make the tea by putting it in a mug and fill with boiling water, I then leave it in for around 2 minutes but you can leave it in for longer depending on how strong you like it. Teatoxes are great for those that need a quick feel-good boost after over indulging or an alcohol heavy weekend. It uses all natural ingredients such as Lemon grass and Ginger root which are good for you and your skin. It means no dieting, which can be a lifelong struggle for a lot of people, and claiming results in as little as 14 days, it is ideal just before that last minute holiday. Most importantly.. It's so easy! Morning Tea - Green Tea Leaf, Mate Leaf, Nettle Leaf, Dandelion Leaf, Guarana Seed. Night Tea - Senna Leaf, Ginger Root, Orange Leaf, Lemon grass, Peppermint Leaf, Liquorice Root, Hawthorn Berry, Psyllium Seed. Where Do I Buy It? The 28 day teatox is available online for £32.90 from the Skinnymint website with FREE worldwide shipping or you can buy the 14 day teatox for £17.90. 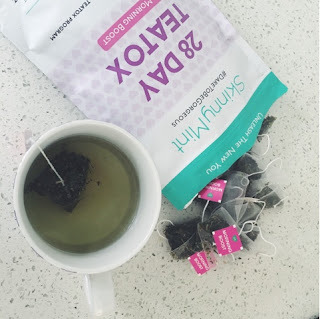 I tried out the 28 day teatox alongside going to the gym 3 times a week which Is what I usually do. 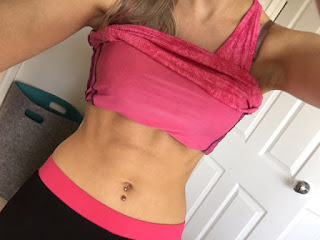 I didn't try the tea to lose weight, as I naturally have quite a small frame, but I did want to see if it helped me with definition and the awful bloating I tend to get in the evenings. Did I See Any Differences? First of all, I can say that I did see a difference in my bloating and I noticed this before when I tried the 14 day program. My stomach was considerably less bloated while drinking this tea which is probably down to the Senna and Peppermint leaf in the night cleanse that is renowned for its ability to reduce bloating. Lastly, alertness. I found the morning tea made me feel a bit more awake through out the day and gave me somewhat more energy. After a few weeks I did have a few days where I felt a little light headed and dizzy shortly after taking the morning tea. I cannot 100% blame this on the teatox but I have heard of this side effect before. I stopped taking the tea for a couple of days afterwards and then continued. 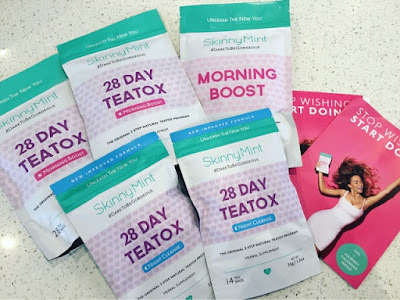 The 28 day Teatox is sold at a steep £32.90 which could be a big negative for some people. The 14 day teatox is more affordable at £17.90 though it does work out cheaper to buy the 28 day one. No. I did not lose weight but a teatox can effect people in many different ways so that doesn't mean that other people won't do. The taste of the Night Tea wasnt very nice in my opinion. It was like hot, ginger water and I really had to force it down my throat. Other people might disagree but it was a bit too gingery for me! 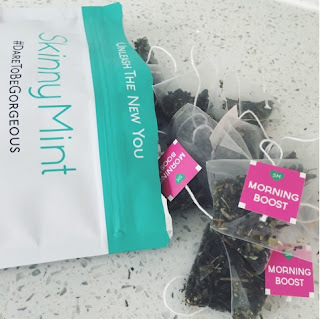 I hope this has been helpful to any of you thinking about whether to try a Teatox or not. Please remember that it can effect us all in different ways, so what hasn't worked for me, may work for you! All products marked with an asterisk (*) have not been paid for with my own money, but has been been sent as a gifted item or PR sample. © LolaBelle Beauty Blog. All rights reserved.